7 Features of a Heavy-Duty Tilt Hopper | Hambicki's Truck & Container Sales Inc.
Scott from a Masonry company in Phoenix, Arizona came into Hambicki’s office to ask if Hambicki’s can build a tilt-hopper container that can withstand the daily abuse from the guys on his masonry crews. With Scott’s input, Hambicki’s built the awesome container in the picture below. 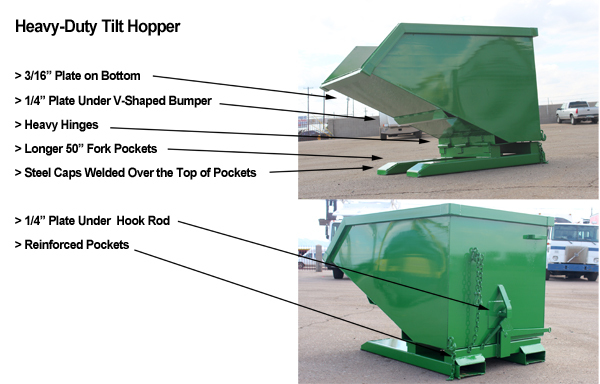 Here are the 7 improvements we added to our standard self-dumping tilt hopper. 1. Replaced the 10 gauge steel on the bottom and dumping lip with 3/16” Plate to prevent heavy bricks from piercing through the tilt hopper when they are tossed inside. 2. Scott liked the bumper on our standard tilt hopper a feature not many tilt hopper’s have, but he wanted more steel to absorb the shock of the hopper being slammed up and down if the fork lift driver didn’t lock the hopper in the upright position. We put a ¼” plate underneath the v-shaped bumper. 3. A third hinge was added to spread the weight of heavy bricks. 4. Fork pockets were increased in length from the standard 48” to 50”, preventing standards fork lift forks from piercing all the way out the front of the pockets. The fork pockets were made with thicker steel. The longer fork pockets keeps the tilt hopper balanced better when full. 5. Fork pockets were reinforced with extra steel covering the front, preventing long fork lift forks from piercing through. 6. Scott said his old tilt hoppers would have the locking rod ripped off from his guys over filling and then driving around and letting the tilt hopper bounce. We added an extra ¼” plate underneath the locking rod so it doesn’t rip off. 7. A steel gusset was added to the back of the tilt hopper’s fork pocket to absorb the shock of a fork truck driving the forks into the pocket and it helps to reinforce the pockets from pealing back from the heavy weight putting pressure on the forks.